Death by a thousand cuts. - Sell. Buy. On The Fly. Death by a thousand cuts. It’s not as bad as you would think. Technically, aerospace parts don’t die. They are reborn. 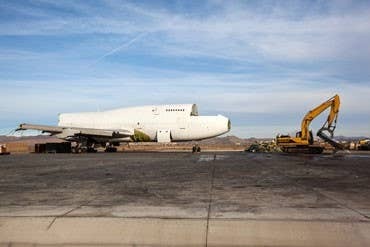 You ever wonder what happens when an aircraft needs to be retired? They don’t send it straight to the aircraft graveyard and issue last rites. No, no—there’s still money to be had. The plane is sold and thousands upon thousands of parts are “harvested” and ultimately pushed into the $4B per year used parts market. This process sounds straightforward and easy, but “let’s take ‘give me the truth’ for $800, Alex”. The ugly answer is that even though airplanes might fly super-fast, such is not the case with the sales cycle for used aerospace parts. It takes about a month to take apart an airplane and strip it free of every useful or valuable bit. Sure, there might be a few “gems” that are pre-sold before the entire plane is completely plundered but it takes time to box up the parts for storage. And from there? It could take weeks, if not months, for the parts to finally get listed for sale (and probably on some archaic, non-user-friendly listing service). Total time elapsed? From part dismantlement to listing it for sale, two to three months. At best. In the age of making money, unless you’re Warren Buffet, it should be a sprint, people, not a marathon. The moment a component came off the plane, the part immediately went up for sale on GoDirect™ Trade with price, product images and quality documents. Sounds like a no brainer in today’s online consumer focused world but I’d like to point out that GoDirect™ Trade is the only aerospace marketplace on Planet Earth that offers this level of information on every single listing. Every component dismantlement event was recorded on an immutable digital ledger through Blockchain technology. Even the aircraft death certificate was recorded on the ledger. R.I.P Airbus A320 but for heaven’s sake, this is exciting stuff! Whether we like it or not, GoDirect™ Trade and Blockchain are putting a full court press on the used parts industry. HAT will eventually be listing parts for sale while an aircraft is still flying in the sky. GoDirect™ Trade is going to push the industry into a level of transparency that will send many seasoned traders into anaphylactic shock but will entice the buyers to do cartwheels of happiness. The stage is set for a major shakeup in the industry. I don’t care who you are or what you believe. Mull on that. But whatever you do, do it now. Join the GoDirect™ Trade community today and be part of the change.